​We're a congregation of the Presbyterian Church (USA), a denomination with deep roots in American history and Reformed Theology. Lake Hills Presbyterian Church (USA) combines a beautiful house of worship and education, a recreation area, and a spirit of joy to create a unique "retreat" for people seeking to know God in a diversity of ways. We know each other by name. We're big enough to get things done, but small enough that you won't get lost. Weekdays at Lake Hills, you'll hear children playing on the ballfields, watch grown-ups huffing and puffing around the jogging trail, and see senior adults coming to community meetings. Our church is a busy place. It's a hub of activity and learning. ​Lake Hills is a church dedicated to service. Our church makes both overseas and domestic mission trips. Our members are active in a number of community programs that share compassion with persons of less privilege. Our youth and children's programs are, in a word, active. Our youth meet on Sunday nights and have a wild time of learning together. They often share their talents during Sunday worship. Our Children's Choirs, Sunday Schools, and Summer Recreation Program are filled with loud, energetic kids who happily demonstrate how the kingdom of God is supposed to look. A congregation of the Presbyterian Church (U.S.A.), Lake Hills stands in a long tradition of faith. We believe we are truly called to be "Reformed and always reforming" - to be always inviting, always learning, always celebrating God's grace. As the suburban area south of Fort Loudon Lake and west of Alcoa Highway in Knox County developed in the 1950's, several residents began to feel the need for a community church. After diligent work by the 32 charter members, Lake Hills Presbyterian Church was organized by Knoxville Presbytery on October 20, 1957, under the helpful sponsorship of the Sequoyah Hills Presbyterian Church. By December, services which had been held in the homes of members were moved to the Presbyterian Chapel (a trailer) on Alcoa Highway; and in February of 1958 , the Rev. Robert A. (Bob) Larson began his ministry as the first pastor. The completed first unit of the building at Maloney Road and Montlake Drive was dedicated on April 10, 1960. 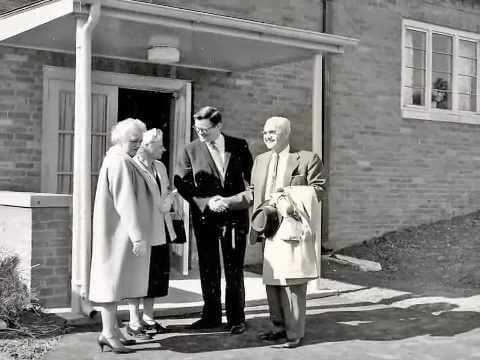 A much-needed larger sanctuary and additional classrooms and offices were added in 1968, increasing the church's ability to serve the worship, instruction, and meeting place needs of the community. In October 2000, the church began construction once again to expand its facility, enlarging the fellowship hall and adding additional Sunday School classes. By 1978, the concept of a community church, first envisioned in 1958, had become a reality. In cooperation with the community and the county, tennis courts, playground equipment, and a ball field had been established, and a supervised summer recreation program for young people was underway. Community organizations felt welcome to use the building for their meetings, as well as Boy and Girl Scout groups. Outreach to the Montgomery Village Ministry, South Knoxville Girls Club, Lakeshore Mental Health Institute, and food pantries for the needy served the extended neighborhood. During its history, the church has been served by pastors: Robert A. Larson, Thomas W. Currie, John S. Carothers, William W. Peters, and James W. McTyre (present). Thanks to the leadership of its outstanding and dedicated laity, Lake Hills remains committed to its original mission, which is to lift up Christ in such a way as to be a church in the community - serving the community of God. Our church is a community of followers of Jesus Christ and a congregation of the Presbyterian Church (USA). We do our best to be faithful in and to the community of God, both near and far. ​Our church is big enough to get things done, small enough that you won't get lost. Our VISION at Lake Hills Presbyterian Church is to be: "A church in the community, serving the community of God." ​Our MISSION is to be: Welcoming, Worshiping, Educating, Celebrating, Tending, and Sending. ​We WELCOME all people as they are drawn by the Holy Spirit into the house of God, the church of Jesus Christ. We WORSHIP God in Christ’s name through the inspiration of the Holy Spirit, through Word, Sacraments, and Song. We EDUCATE adults and children about scripture and its application to our lives. We CELEBRATE God’s love in community-building groups and gatherings to demonstrate and share the unity of the Holy Spirit. We TEND the members of our church, community, and world in acts of compassion and healing. We TEND to our church’s staff, finances, and property. ​Presbyterians trace their history to the 16th century and the Protestant Reformation. Our heritage, and much of what we believe, began with the French lawyer John Calvin (1509-1564), whose writings crystallized much of the Reformed thinking that came before him. A little Presbyterian history. Portions of the Presbyterian church in the United States have separated from the main body, and some parts have reunited, several times. The greatest division occurred in 1861 during the American Civil War. The two branches created by that division were reunited in 1983 to form the Presbyterian Church (U.S.A.), currently the largest Presbyterian group in this country. Presbyterian theological beliefs. Some of the principles articulated by John Calvin remain at the core of Presbyterian beliefs. Among these are the sovereignty of God, the authority of the scripture, justification by grace through faith and the priesthood of all believers. What they mean is that God is the supreme authority throughout the universe. Our knowledge of God and God's purpose for humanity comes from the Bible, particularly what is revealed in the New Testament through the life of Jesus Christ. Our salvation (justification) through Jesus is God's generous gift to us and not the result of our own accomplishments. It is everyone's job — ministers and lay people alike — to share this Good News with the whole world. That is also why the Presbyterian church is governed at all levels by a combination of clergy and laity, men and women alike.